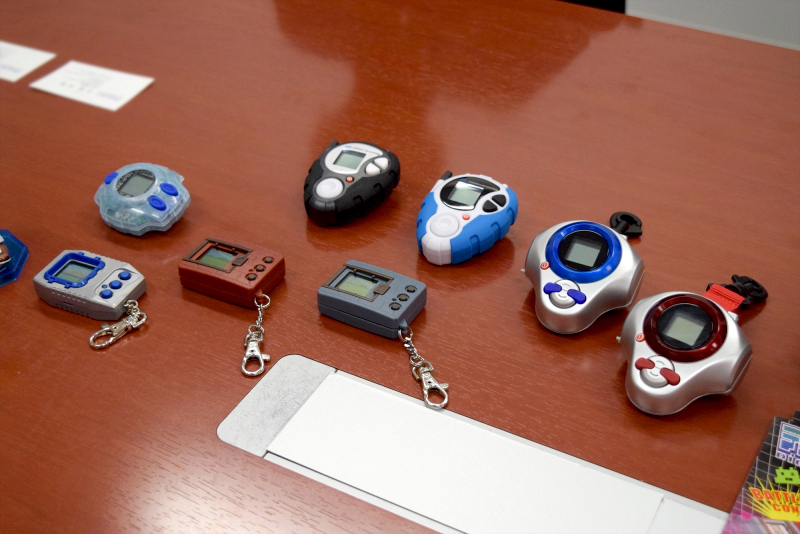 Recently the website 4Gamer had a big interview with Bandai regarding the Digimon 20th Anniversary V-Pet. 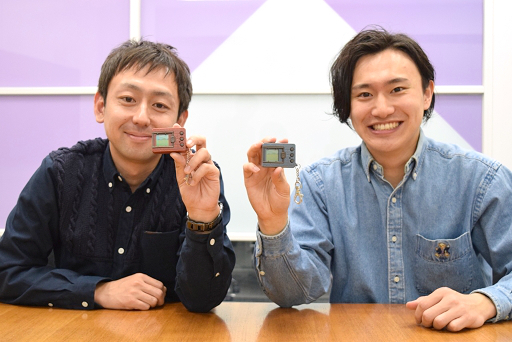 This interview covered tons of details of the upcoming anniversary product, along with insight into the choices and changes made in the product, along with details on products like the various 15th Anniversary Digivices, and even some of the other things being planned for the 20th Anniversary of Digimon. We've translated the interview, and are presenting it with the images being placed roughly where they were in the original article. Bandai is accepting pre-orders for the LCD game Digital Monster ver. 20th (henceforth referred to as Digimon ver. 20th) on Premium Bandai, from January 6th to March 27th at 11pm. The Digital Monster series, or Digimon for short, is celebrating its 20th anniversary this year. This Digimon ver. 20th is a commemorative re-release of the LCD Digital Monster game, which went on sale in 1997 and serves as the origin of the series. While the LCD toys related to the anime series such as the Digivice and D-3 have undergone several re-releases so far, the fact that the original Digimon toy is being revived should be big news to fans of the series. We at 4Gamer are here today to interview Yuuta Abe and Shou Saotome from Bandai, to get a clear view of what Digimon ver. 20th really is. 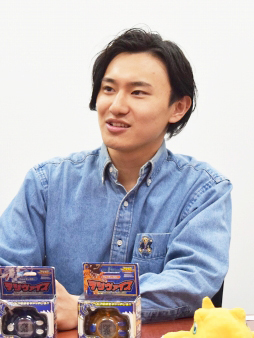 Tomoyasu Ootawara, from Bandai's Boys' Toy Division's Merchandising Team, will be here with us today as well. Thank you for taking the time out to participate in this interview today. First off, we would like to ask how the both of you have been involved with the Digimon series up to this point. I am currently involved with product planning and development for the anime Digimon Adventure tri., which currently has 4 installments released. Also, I was involved in planning the re-releases of the 15th anniversary anime merchandise: Digivice ver. 15th, D-3 ver. 15th, and D-Arc ver. 15th, to be aimed at older audiences. I am currently involved in the planning and development of all the Digimon series merchandise marketed towards older audiences, together with Saotome. Not only that, I'm also involved with the product planning for children-targeted merchandise for Digimon Universe Appli Monsters. To put it another way, I'm currently overseeing the planning and development of the Digimon series' merchandise. The two of you still seem quite young. Were the two of you part of the generation that grew up playing the first generation Digital Monster v-pets, and watching the anime series? Yes, that's right. I was 8 when Digimon Adventure first aired, so you could say I was right in their target demographic. Similarly to how Saotome was from the anime's generation, I was from the generation that grew up playing the LCD toys. I'm not as familiar with the anime series myself, so in a way the two of us balanced each other out. To be able to participate in the making of products that you loved as a child...to fans of the series, this must be a very enviable position you are in. 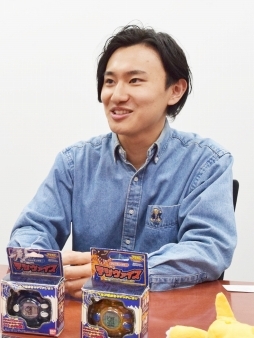 There are many staff members in Bandai who are in similar positions; staff to whom being able to plan for and be in charge of a product they liked as a kid is like a dream come true. Seems like we have two people from the ' Digimon generation' involved in planning for the Digimon ver. 20th. Could you tell us more about the circumstances or inspiration that led to its development? As mentioned briefly before, as the 15th anniversaries of the anime series approach, we continued to churn out commemorative anime merchandise such as Digimon Adventure's Digivice, Digimon Adventure 02's D-3, and Digimon Tamer's D-Arc. And, now that we are approaching the 20th anniversary of the original Digital Monster toy that was released in 1997, we wanted to return the Digimon that children all over the world first played with back into their hands, and that's where the idea for development started. How was the reception when you announced this product? It was fantastic. We opened pre-orders for Digimon ver. 20th through Premium Bandai, our company's direct sales site, and we had an influx of customers that hadn't signed up as members on the site till now. Out of the customers that have pre-ordered the product, about 40% are new members, so it feels as if we are now receiving the support of a number of fans who felt 'I wasn't that interested in the anime-related Digivices, but I want to try out the first generation Digimon toys'. We received a large amount of reception on our article as well, so we can feel this strong surge in attention. We are very thankful that this is the case. Do you have an idea of the main demographics purchasing this product? We've received a lot of orders from the 27-30 age group. 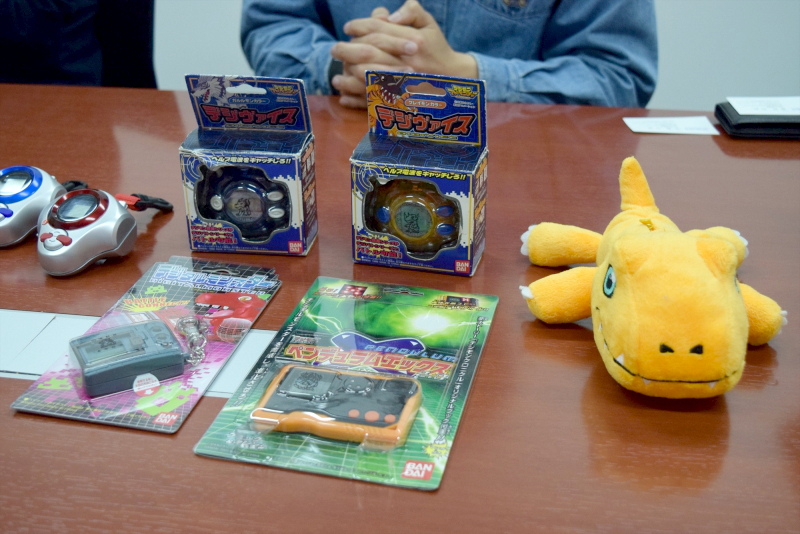 In contrast, the Digivice and D-3 had a lot of customers in the 24-26 age range, so we can see from there the rough differences in the age groups that got into Digimon through the anime, and those who got in through the LCD games. How about customers in the teenage age range? It seems that there aren't that many customers below 19. 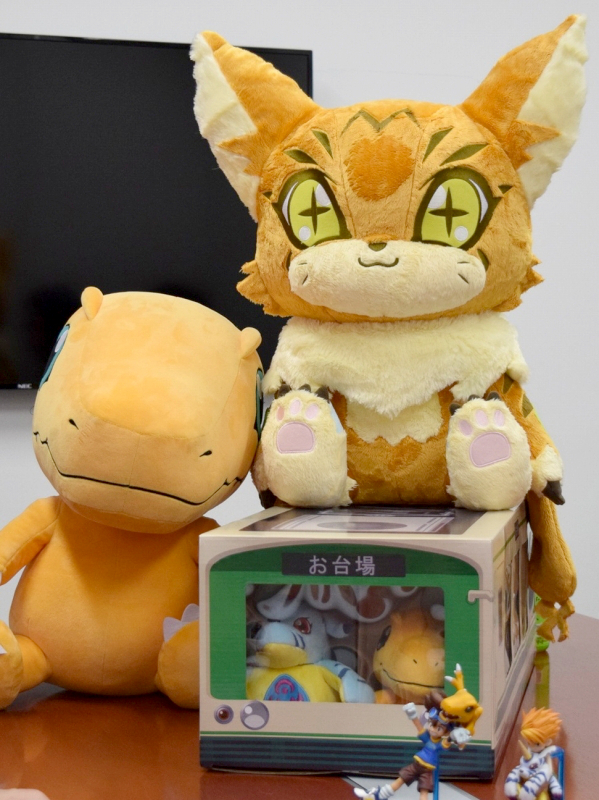 Currently, the core demographic that is purchasing Digimon merchandise seems to be those who were in elementary school when Digimon Adventure first aired in 1999, and who would be in their early to mid-20s now. 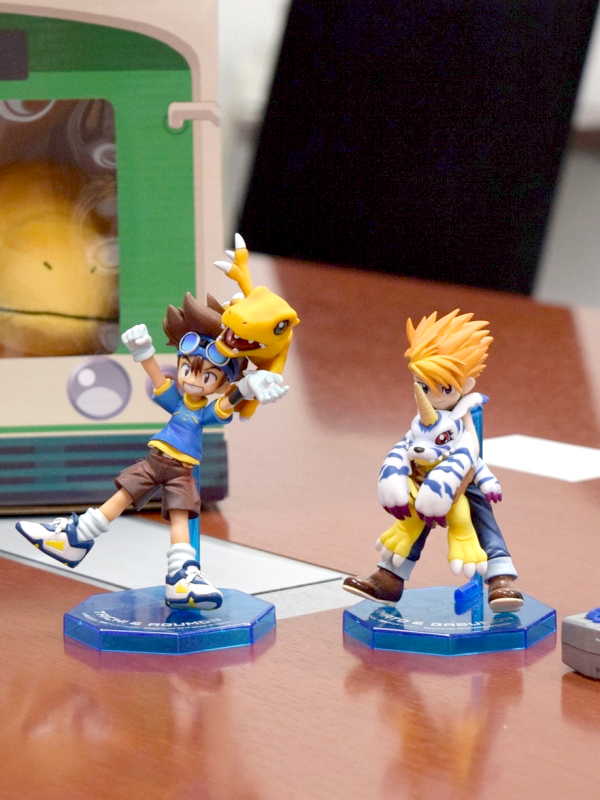 Customers in their late-20s to early-30s tend to purchase more of the LCD games, as well as figures of the Digimon themselves. I see, even a well-selling line of products shows different purchasing patterns among different generations. As I recall, the both of you came from the LCD game generation and the anime generation respectively. 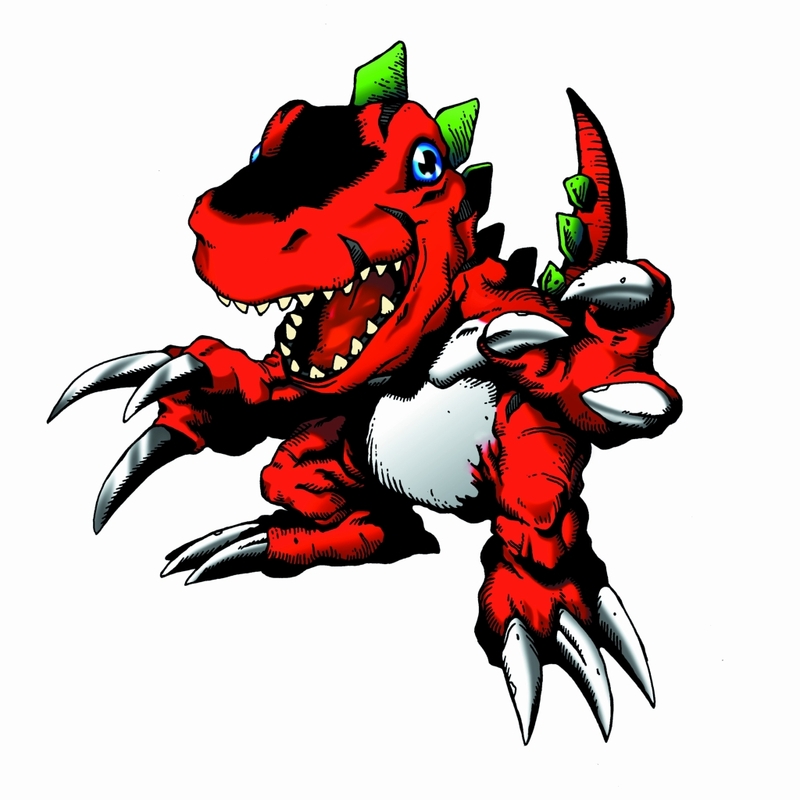 Could you tell us your favorite Digimon, or Digimon that left a deep impression on you? I loved Digimon Adventure, so I really liked Wizarmon. Ah, that scene* is carved deeply into the hearts of fans. I like Elecmon as well. He was the Digimon who put his life on the line to protect the Digieggs in the Village of Beginnings, where Takeru visited. In a fight with a powerful enemy, Wizarmon gave his life to protect Tailmon. This sparked Tailmon's evolution to Perfect level, which allowed her to finish off the enemy. It is a scene widely discussed among fans of the anime, even now. How about Abe, who was part of the LCD game generation? 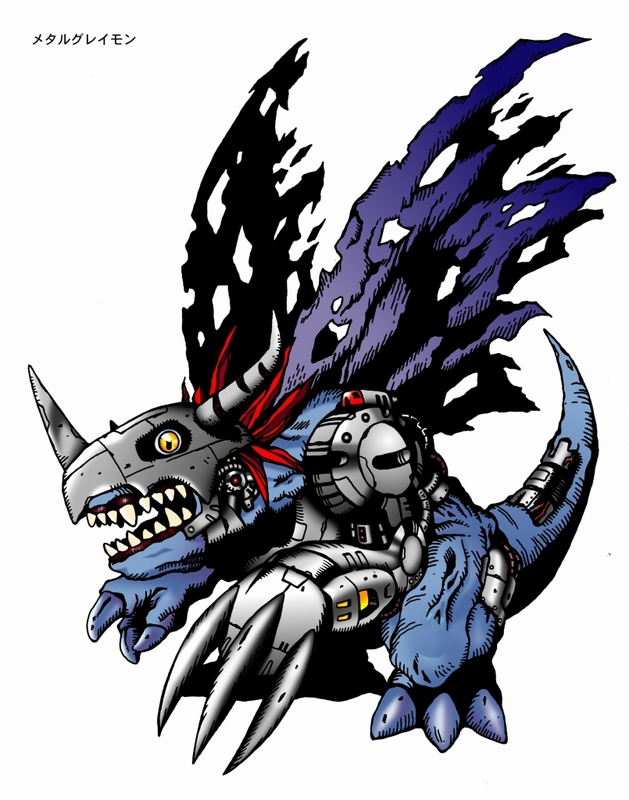 A memorable Digimon for me would be Mamemon. It was pretty difficult to get your Digimon to evolve into Mamemon. Take Metalgreymon, whom you could only evolve to by raising the Adult-level Greymon seriously and properly. And there's Monzaemon, whom you could obtain fairly easily as long as you trained Numemon properly. And then there's Mamemon, whom you could only evolve to by training a Digimon that could evolve into it - not too seriously or not too negligently, but a balance between both. It constantly left me wondering 'how many care mistakes did I make already?' which could be quite a pain. Indeed, most people then probably evolved their Digimon into Metalgreymon; not as many people got Mamemon, probably. Yes. That's why, I remembered being ecstatic when I was finally able to evolve into Mamemon, after all I went through. Not only that, I liked that 'gap' between its appearance and abilities, seeing how such a small character could throw bombs and all. It may be small, but it's really powerful, isn't it. It beats Metalgreymon easily even in link battles, after all. Speaking of the ver. 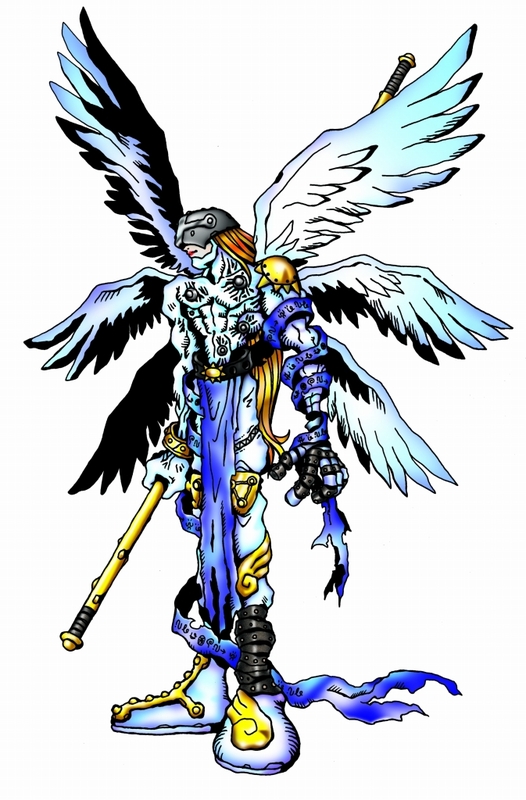 1, Monzaemon was the strongest Digimon there, followed by Mamemon and then Metalgreymon, correct? The impact of having Numemon, the weakest Digimon, evolve into Monzaemon, the strongest Digimon, was definitely great. 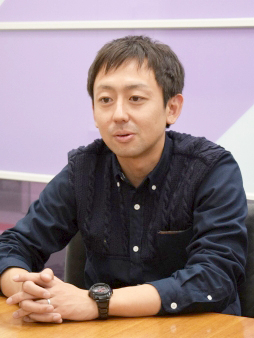 According to the developers, Monzaemon was added in as a kind of 'salvation measure', so as not to discourage players from stopping their Digimon raising halfway. So, a friend with a Numemon might one day just evolve and turn the tables on you. I thought it was well-thought-out. [image caption: Although it may seem like Metalgreymon (left) is the strongest at first glance, it is actually the weakest, with Monzaemon (right) being the strongest. 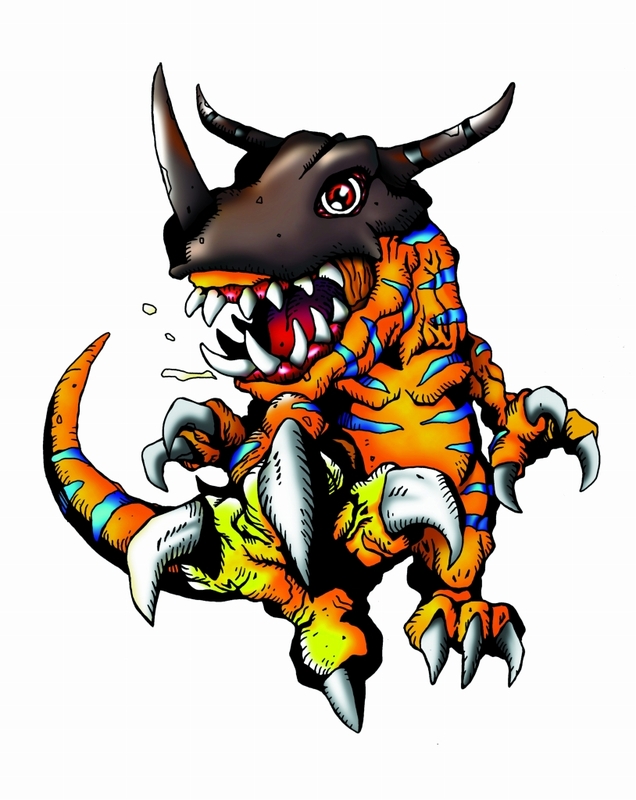 Looking over the original Digimon designs again, they were really drawn to project this 'wild' image. You can see the saliva flying from Greymon's mouth, and it looked ready to attack you any moment. As the years go by, it feels like Digimon began to tend towards more heroic designs; do you think the anime series served as the 'turning point'? 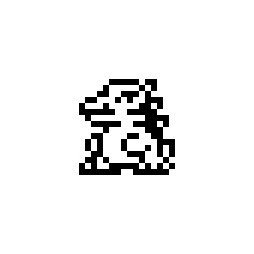 I heard that the original concept for Digimon was to be a 'battling Tamagotchi', so the monsters were made in the image of feral monsters such as dinosaurs that you could raise inside a v-pet. 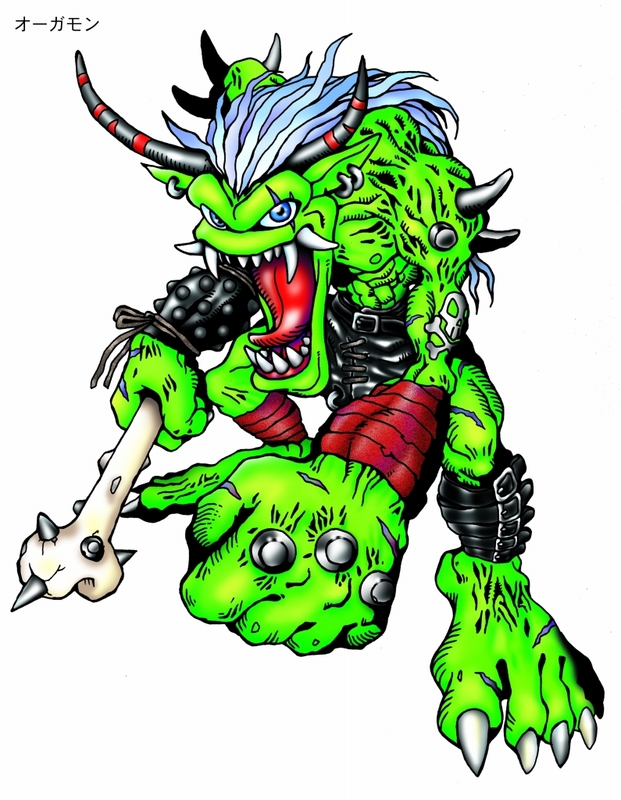 That's why there were many feral-looking designs among the early Digimon. As the series got turned into an anime by Toei Animation, there's this new cuteness and sense of 'partners' that came to be associated with Digimon, so we also got many Digimon born out of that feel. We can see the anime's strong presence from how the anime now serves mostly as the standard face of Digimon. There were some monster evolutions in the original v-pet that would be hard to imagine with the current series. Abe: Looking back on them, they did feel out of place though (laughs). Ootawara: It's completely different in the games, after all. 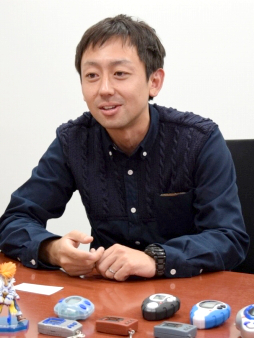 Saotome: I was introduced to Digimon via the anime series, so when I look at the evolution chart for the original game, it still feels out of place to me even now (laughs). 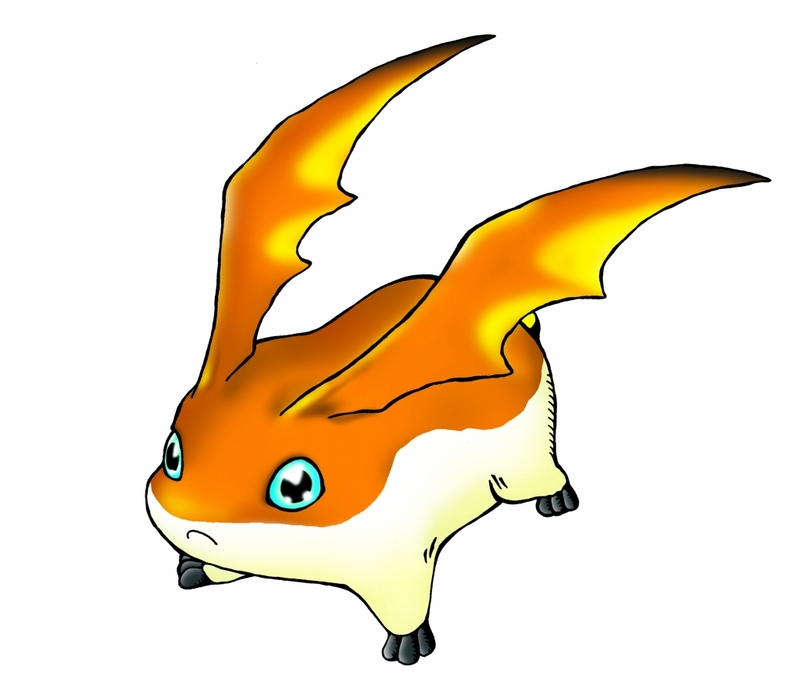 Patamon evolves into Angemon in the anime series, but they weren't even in the same version when it comes to the LCD games, so Patamon couldn't evolve into Angemon there. Trying to raise it the same way would net you Ogremon instead. It is as you say (laughs). However, since we are aiming to recreate the original with Digimon ver. 20th, we don't intend to change anything on that front. What we might feel like 'something's not right' when we play it now, is also nostalgia for the people who played it back then, so we felt that it was something we shouldn't change. This also applies to the power difference between Metalgreymon, Mamemon, and Monzaemon that we mentioned earlier. Thoughts like 'Why is the weakest looking Digimon the strongest?' or 'This evolution is so weird now that I look at it' that occur to us thanks to the 'weird but interesting' bits of the game are something that we wanted to retain as we worked on the ver. 20th, so we are not changing those parts. Playing these games with our 'current common sense' would indeed make for a fresh experience. When it comes to Digimon's LCD games, what's iconic isn't just the monster illustrations, but also those pixel illustrations that were made to fit within the 16x16 space. Were those pixel illustrations done as a set together with the monster illustrations? Regarding pixel art, there are some Digimon which have them, and some that don't. The pixel and monster illustrations for Digimon that appeared in the LCD games were definitely made as a set. While some of the Digimon that debuted in console games eventually got pixel illustrations made of them, there are also some Digimon that did not appear in any LCD games and thus only have official illustrations. So it seems to be the case that not all Digimon had pixel illustrations made of them. Though, when you think of Digimon as having originated from LCD games, it only seems appropriate that all Digimon should get some form of pixel art. I hope that we get to work on more of them in the future. Even so, it takes some skill to make those pixel illustrations... the Digimon are all identifiable, despite being in 16x16 resolution and in monochrome. It's amazing, isn't it. The pixel artwork, as well as the creation of the product, is being handled by the diligent people over at WiZ. All of the pixel illustrations manage to keep their identifying features. Not only that, they were capable of skilfully inverting the colors to create pixel artwork for recolored Digimon; I have nothing but admiration for the amazing staff who worked on them. Due to the size of the interview the rest follows in the next post. We've split it at the same point the original interview had it's page 1 and page 2. Alright, now that we've heard plenty about the original Digimon v-pets, I think it's time to get into further detail on the ver. 20th itself. When the Digivice ver. 15th was being made, apparently none of the original die-cast molds, original data, or even blueprints were left, so it had to be made from scratch. Is the die-cast mold being made from scratch this time, too? Yes, there's no question that we are using a brand-new mold this time. 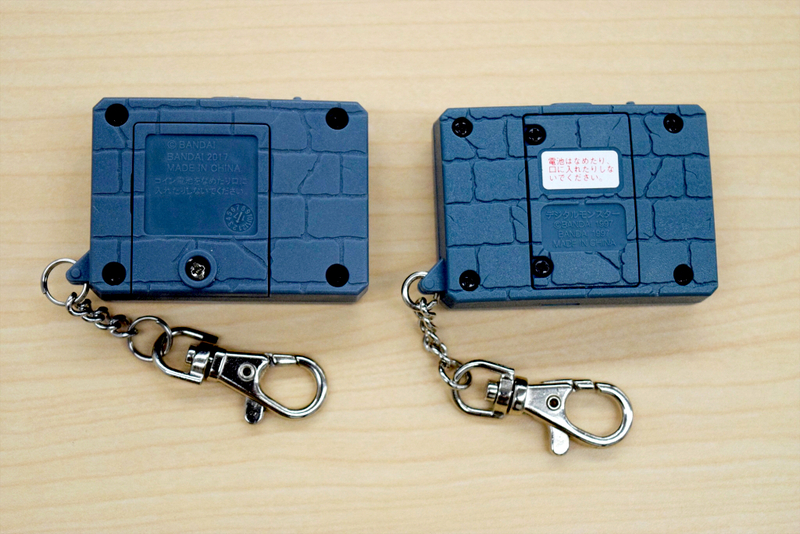 The re-released Digivice, D-3, and D-Arc have all used new molds with added details, and the ver. 20th is no exception. You're right about that. We still hope to keep the faithfulness to the original design. The back design naturally has had some changes due to the change in battery type, but we are trying to stick to the original as closely as possible. In the original Digimon v-pets, the food and protein graphics, as well as the training methods differed between versions. How will that be handled in the ver. 20th? On that front, we will be sticking to how they were represented in the ver. 1. The ver. 20th was made to be a re-release of the ver. 1 to begin with, which is also reflected in the color choice, matching the Brown and Grey colors that the ver. 1 came out in during 1997. Using that as the base, we will be adding the Digimon that debuted in ver. 2-5. It was stated that a multitude of Digimon aside from those in ver. 1-5 will be included in the ver. 20th, but can we get an estimate of how many Digimon will be added? 14 Digimon were raiseable in the ver. 1 alone, while in the ver. 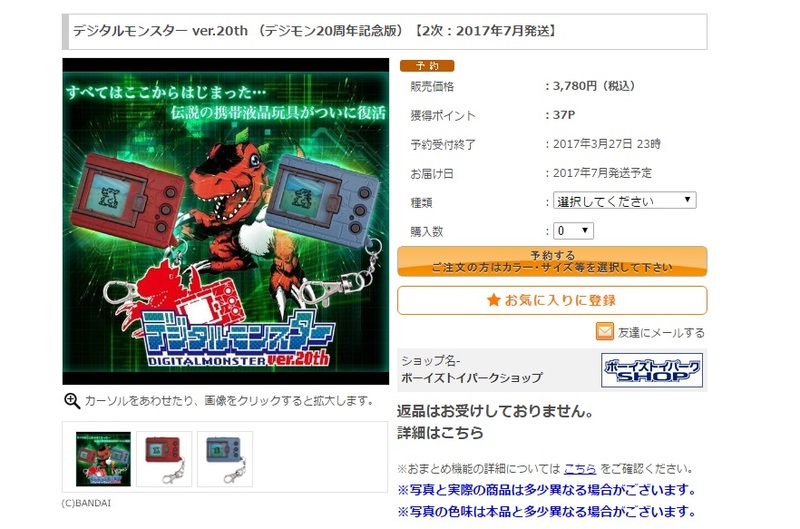 20th, 120 Digimon will be raiseable, including the Digimon from ver. 2-5. It appears that Ultimate level evolutions, who weren't present in the originals, will be added to the ver. 20th too. Correct. This time, new Ultimate evolutions that weren't possible in the original versions will be made available. Are there any plans to release the evolution tree, including the newly added evolutions, on the official site in the future? Or would you prefer players to discover these evolutions on their own? We're still not decided on that matter... though we intend to have it up sometime in the future, probably. 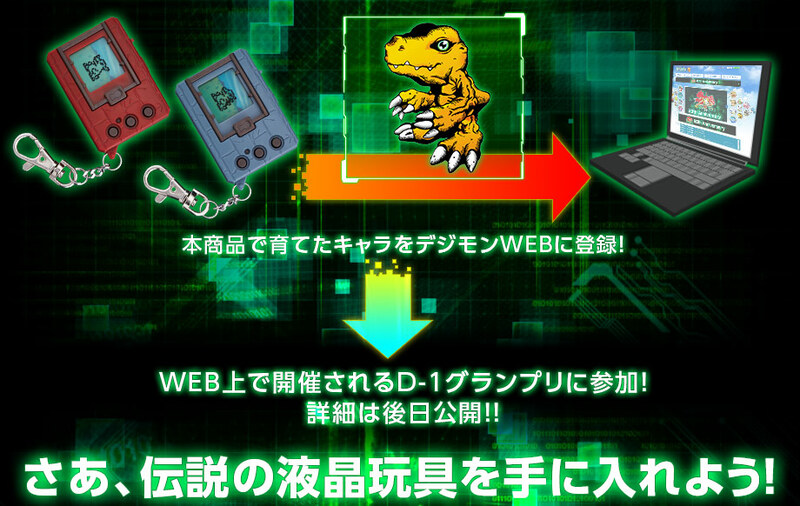 If we do publicly release the information, it'd probably be bit by bit on the official Digimon Web website. The Digivices we've released up till now have contained hidden features that we've seen customers discover on their own, and proceed to create discussions on the internet about it, so we do expect that players might be able to figure out the evolution tree themselves as well. Internet access was still uncommon among households when the original v-pets were first released, so I would guess that the players progressed while sharing information with their friends. Although we're in an era where we can easily find anything we're looking for over the net, I think playing without consulting the net for information could also be a fun way to experience the game. Back then, even the game guides didn't provide exact information on the conditions required for evolution. They wrote them in a very ambiguous way (laughs). They would write things like 'raise them irregularly', or 'overfeed them many times'. It might be interesting to release walk-through information in that format (laughs). Looking back at it, because of their ambiguous wording, there was also fun to be had in figuring things out through trial-and-error. While we aren't sure at this point whether we will release 'walk-through information', we hope to recreate past memories in players by having them discover new things as they play; it would make us very happy if we could achieve that. It's been stated that there will be new, special Digieggs that can be raised after meeting certain requirements. Will the evolution paths of the Digimon hatching from those eggs be fixed? Yes, they will. The special Digieggs will follow a set evolution path. For example, the special Agumon will evolve into Greymon, Metalgreymon, and Wargreymon, just like in the anime series. I see, so it's a feature put in to acknowledge the anime series? That's right. After some trial-and-error, we managed to settle on a repertoire for the special Digieggs. As mentioned earlier in the interview, there is some difference in ages between the original Digimon v-pet generation and the Digimon anime generation. However, we thought that fans that bought the anime-originated LCD games such as the Digivice ver. 15th might also be interested in the original Digimon v-pets, so we decided to add this feature in to appeal to the fans of the anime series. Having a fixed evolution path does help to stay true to the anime series. It was also stated that the WarGreymon and MetalGarurumon resulting from the special Digieggs can 'fuse' to become Omegamon; is this new fusion feature similar to the Jogress evolution we got in Digimon Pendulum? Image-wise, it is similar to Jogress, with 2 Ultimates fusing to become a different Ultimate. So, in the ver. 20th, this fusing of 2 Digimon, like WarGreymon and Metalgarurumon, resulting in a separate Digimon like Omegamon, will be termed as 'fusion'. Not only that, more than half of the Ultimate Digimon resulting from fusion will be completely new Digimon. Ehhh! Is that so? I wasn't expecting brand new Digimon at all. The official illustrations aren't done yet, but the designers are working on them right now so they may be posted to the official site any time after they're done. * I think they're all pretty cool Digimon, myself. *This interview was done on February 22, 2017. That's something great to look forward to. It was also stated that the growth speed of the Digimon has been altered in the ver. 20th. Why is that so? That was one of the features where we were struggling over whether to change it or leave it as is... however, we did go through lengthy discussions to determine what would be the best growth speed for the Digimon, to account for the Digimon fans who have now become adults. It must've been a hard decision. We have a staggering 134 Digimon available in the ver. 20th, so we decided to speed up the growth of the Digimon so that Digimon fans, even those who are now busy working adults, will be able to meet the Digimon they have fond memories of. One of the exciting new features of the ver. 20th is the ability to raise 2 Digimon at one time, isn't it. Yes. We are introducing this new system, as a first in the history of Digimon LCD games. Fans have been very curious about this new mechanic. It's hard to imagine how we will go about raising 2 Digimon on such a small screen. Could you share more about this feature? 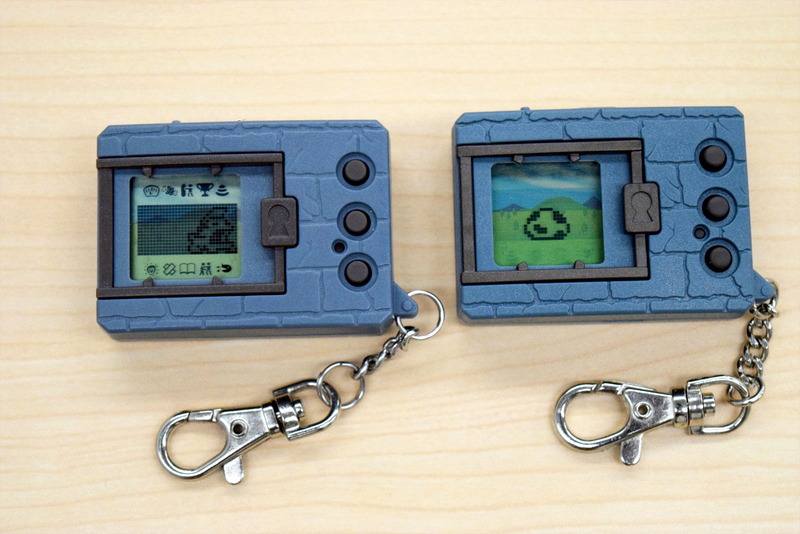 There will be an option to display one Digimon at a time, or to display both at the same time while raising them. Since Digimon evolve differently based on how they are raised, they can be raised on separate screens when you want to clearly distinguish how you raise both of them, while you can also feed both of them at the same time by switching to displaying both Digimon on-screen. 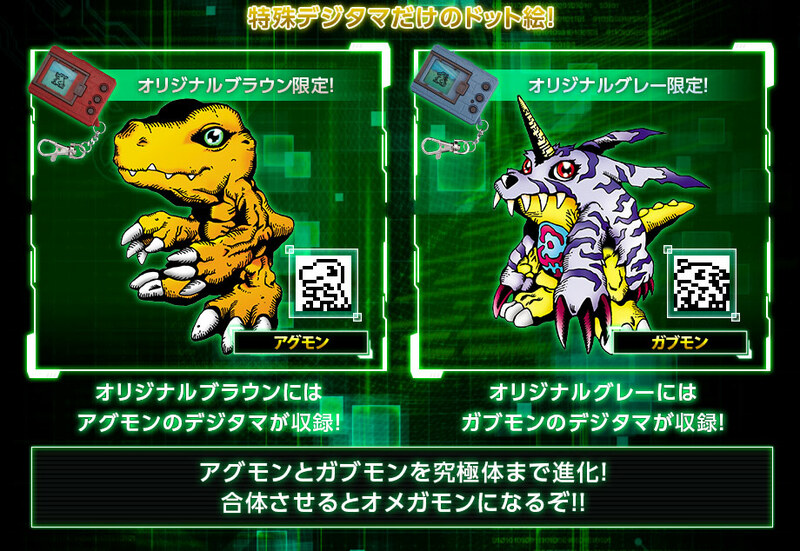 I see you can look at the status screens for both Digimon separately (fiddles with the v-pet). ...Oh, there seems to be a new stat that says 'Effort'. Yes. Previously, the stats included were 'Age, Weight, Hunger, Strength, Energy, and Win Ratio', and this time we're including a new stat called 'Effort'. This stat rises as the Digimon undergoes training, and will factor into evolution requirements as well. 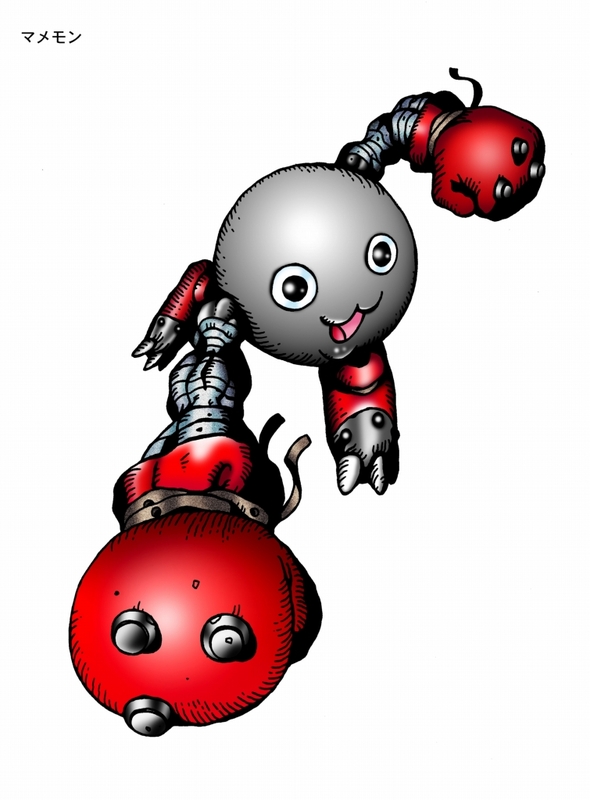 In the past, the Digimon kind of get stronger as they train, with the exact amount being stored in internal data. I see it's become a visible stat now. That's right. It's basically a stat that used to be invisible, now made visible on the status screen. Previously, you would have to keep count of how many times the Digimon underwent training, but considering the players who have to work while raising their Digimon, we decided that it would be more helpful to make the stat visible, and thus implemented it. The evolution tree has expanded considerably from the original, so we also wanted to make raising as smooth as possible. It seems there are also two additional menu icons, compared to the original. Those would be the 'Battle Mode' and 'Album Mode' icons, respectively. It was impossible to do battle without a second player in the original v-pet, so the addition of battle mode allows players to battle even without another player, with Single Battle and Tag Battle modes. I see. In the older series, it was impossible to evolve to Perfect or further without having done a certain number of battles, so it would've been tough on people who didn't know others that played with the v-pet as well. It's great that this single-player mode was added. There will also be some enemy Digimon that do not appear outside of Battle Mode. Those will be Digimon that fans are probably familiar with, so I hope they will be able to enjoying playing this mode too. So, Album Mode is a mode that records all the Digimon that you have raised thus far. However, will the data be kept if the battery runs dry? For the old Digimon v-pets, the data would be reset if the battery ran dry, so this is a possible point of worry. No worries about that. The device will have an in-built memory that will store your play data, so you can load your data from there and continue playing even after changing batteries. As a child, it was a challenge to make sure to change the batteries while keeping the Digimon I raised intact. Looks like there's no need to worry about that now (laughs). Exactly (laughs), you should now be able to change the batteries without any worry. Also, it was stated that there will be an online D-1 Grand Prix held in the future, but how will entering work this time? We're still in the midst of developing that so we can't reveal too much right now, but it works by converting your raised Digimon into a password, which can be entered on the website to register your Digimon. Then, we plan to have those registered Digimon fight it out in the Digimon D-1 Grand Prix that will be held in the future. So the status of your Digimon can be seen in the form of a password? We may or may not end up changing the format, but what I can reveal now is that there are 3 levels of strength to each Digimon, and that will be how the password is generated for each Digimon. In the case of Agumon for example, there will be 'strong', 'normal', and 'weak' statuses that will translate into passwords. It looks like a lot of thinking has gone into making the password generation work? Yes, definitely. Because of the small screen, we can't even output a 2D barcode image on it. As with the Battle Mode mentioned previously, players might find it hard to enter the D-1 Grand Prix even if they wanted to if they didn't know anyone they could battle with, so we went for an internet-based tournament instead. This re-release has so many new features that we can't even cover them all here. While you could have gone with recreating the original v-pet one-for-one, why did you decide to add in these new features? We had a whole list of ideas during the planning stage, and while recreating the original as is was one of those ideas, in the end, we felt that we wanted to really surprise the fans, since we're celebrating the important 20th anniversary, after all. We put in brand-new mechanics that we've never done before, such as the ability to raise 2 Digimon at once, in hopes of pleasing the fans too. Even with all the Digimon spanning versions 1-5, and with all these new features, it's amazing that the ver. 20th still manages to cost 3500 JPY (excluding tax), considering the original v-pets cost 1980 JPY (excluding tax) each. It feels like...'oh, if only we split them up and sold them separately' (laughs). There are currently no plans for a regular release of the ver. 20th, are there? Yes, there aren't; after all, this price point was also made possible because of the nature of selling it exclusively through the direct-sales site, which means we only have to produce the exact amount that was ordered. We use Premium Bandai for cases such as this, when it would be unrealistic to produce for regular sales, or when the prices are high. 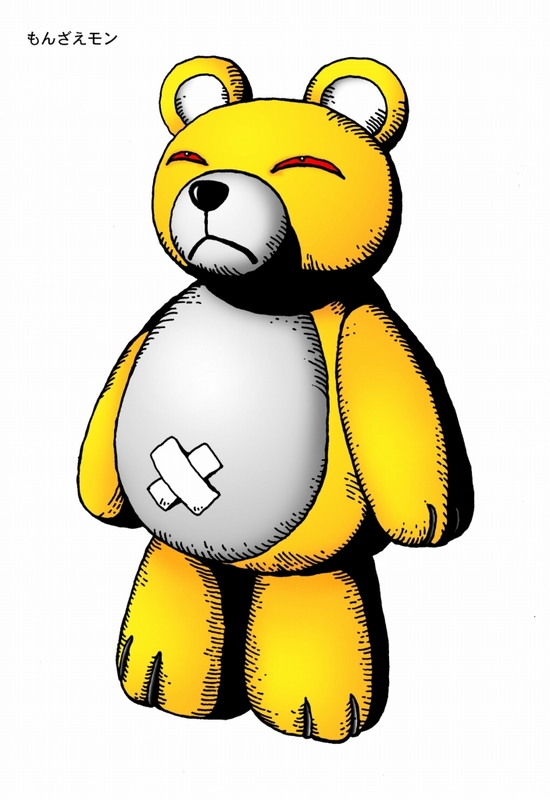 We have received feedback on prices being too high as well, but rest assured we are trying our best to deal with that. I think there might've been a lot of people out there who thought 'I didn't own that version, but I really wanted to play it!'. Whether it was because many customers felt that way or not, we received more than double the number of pre-orders we were expecting. While the first pre-order batch of the ver. 20th is slated to be sent out in June, June 26th 1997 was the release date of the original Digital Monster v-pets, so there is also that little surprise in having the ver. 20th arrive during the same time 20 years later. August 1st is a very well-known date for being the date when the Chosen Children embarked on their adventure in Digital World in Digimon Adventure, but in contrast, June 26th, which was when the LCD games were first released, isn't nearly as well-known. We hope that with the Digimon ver. 20th, we can also make this date more well-known among fans, so that it can be treated as an anniversary date as well. However, the first batch of pre-orders to be sent out in June is already sold out, so pre-orders from this point onward are slated to be sent out in July. You are guaranteed to receive one as long as you place an order by 11pm on March 27th, so we hope readers can consider it. Seeing Premium Bandai kickstart Digimon's 20th anniversary with the ver. 20th, and hearing about plans to hold the D-1 Grand Prix in the future, we can hardly contain our future expectations for Digimon. Could you tell us more about what's in store? The ver. 20th is just the tip of the iceberg of what we have in store for 2017, which we hope to turn into a 'Digimon Festival'. There are plans to release merchandise featuring pixel art of the original Digimon in the future, as well as re-releases of old toys. Digimon fans can look forward to not only the Online D-1 Grand Prix, but also a planned live event where Digimon fans can gather using the 20th anniversary as an occasion to do so. And that's not all; we also have plans to bring the anime and related works into the festivities, and are currently holding discussions on the matter with Toei Animation. We'll be looking forward to seeing not only more merchandise, anime, and games, but also more of that momentum that Digimon has been picking up with in recent years. It seems that's all the time that we have, so please leave a closing message for all Digimon fans. Thank you for continuing to support Digimon. Although 20 years have passed since the original 'Digital Monster' v-pet was released, we made the ver. 20th with the fans that played the original in mind. We have left what we felt shouldn't be changed as is, while at the same time adding in some exciting new features, so I am positive that fans will be able to enjoy this product. Do get it and enjoy it if you can! Those of us involved with the development of the ver. 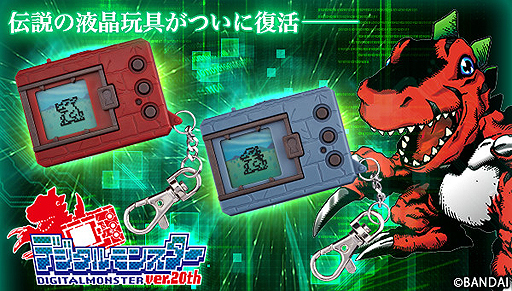 20th also belong to the generation that experienced the original 'Digimon' first-hand, so we have put in our best efforts to create a product for the fans, which whom we share the same viewpoint. Being the 20th anniversary, this is an important year for Digimon, and we hope to continue the ball we've kept rolling from recent years to continue pushing out even more. Please look forward to what we have in store! Lots of fantastic information on the V-Pets and some of the decisions made. Big thanks to garm for translating everything, and thanks to Shadow Shinji for bringing it to our attention. Took awhile to edit all of that, and make sure it'd show up correctly on the forum but it appears to have all worked. The order period for the 2nd batch of 20th Anniversary Digimon V-Pets closes on March 27th if you want one. Oh? Monzaemon was originally the strongest? Now a certain scene in Cyber Sleuth suddenly makes sense. I always thought it might have been some sort of in-joke. If he is the strongest, he should have a new Ultimate form as a new evo...Hopefully? That was a bit more informative than I expected, it's especially interesting to see those statistics of the audience ages. Also the mention of them including toei animation in the anniversary celebration stuff seems very promising... I wouldn't expect a full new movie or anything but I could imagine them producing some short for the occasion and who knows depending on the reception there could be more... I guess I'm just really hoping, that since most of the 20th stuff is aimed at older fans, we'd eventually end up with some anime project aimed at older audiences that isn't Tri. 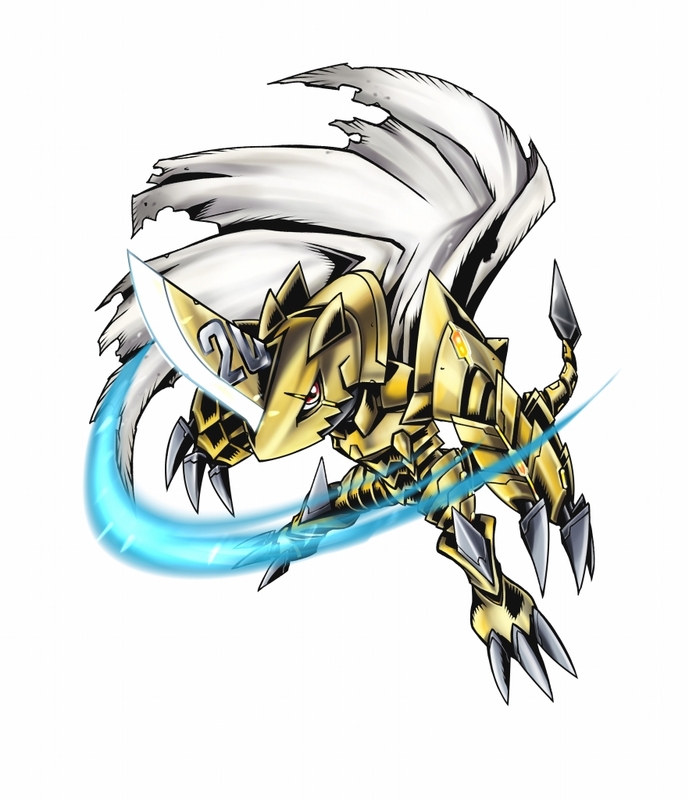 And I wonder how many new Digimon will be in the V-pet; "more than half of the fusions"... since we know of 2 "traditional" fusions (Omegamon and Examon) that means there have to be at least 3 new fusions in order to satisfy the "more than half" statement and of course it's possible we don't even know all the normal fusions they'll include yet, so that number could rise. 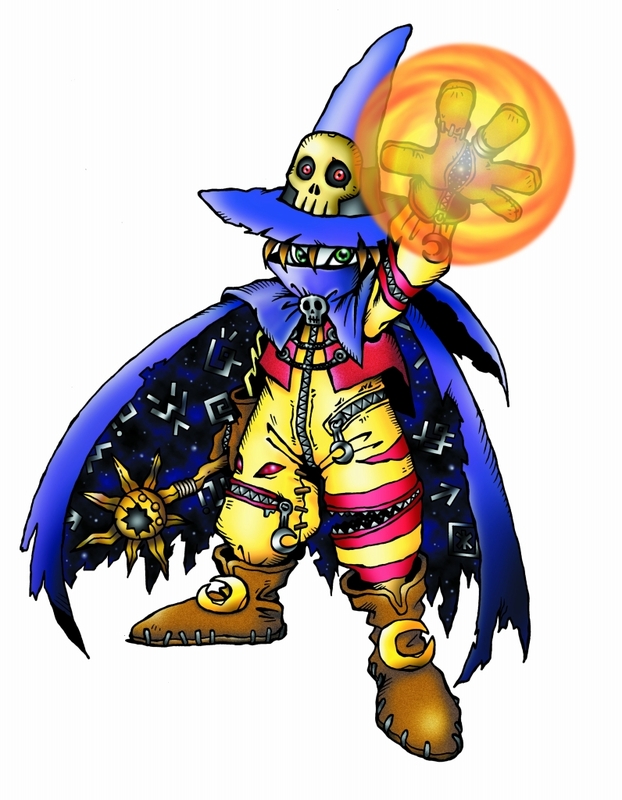 I also don't think I've ever seen the design shift in Digimon officially recognized that explicitly... so again my hope is that at least for some of the new Digimon created for the 20th anniversary they'll purposefully go back to the older design paradigms. Okay, what has me excited is the line about over half the fusions in this game are new. 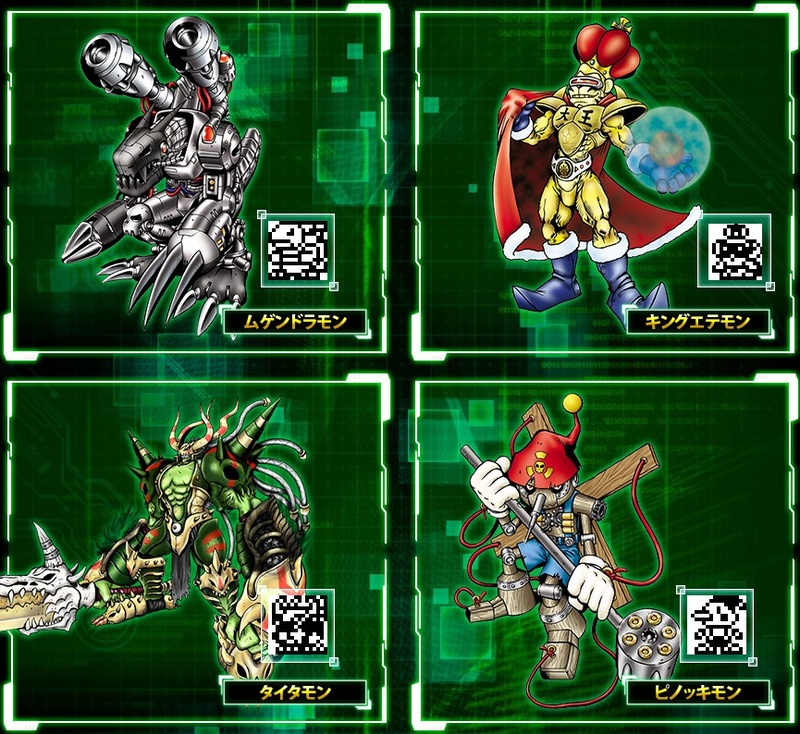 Since we know Omegamon and Examon are in the game, we can then assume we're at least getting three more new Ultimate Digimon on top of all the new ones we've already gotten revealed. Edit: Oh, I got ninja'd by Theigno pretty hard, but yeah, still excited to see them. Last edited by Nightwing; 03-21-2017 at 04:55 PM. This isn't entirely on-topic, but do we have actual complete lists of all the Digimon in each of the anniversary Digivices? There are plans to release merchandise featuring pixel art of the original Digimon in the future, as well as re-releases of old toys.